Finally I had the time to test this. Well done, I like the level design. It feels non linear, and incredibly moody. The animations are quite good too, specially the main character's in wolf form. I loved how the camera follows the action, too. I didn't like the way you lose momentum, though. With time I learned how to deal with it, but somehow it didn't feel natural. Or maybe it is not that the player loses momentum completely, but the time it takes to gain it again. Another thing that IMHO should be polished is vertical screen transitions. There are many times when you don't jump with enough strength and you get several transitions in a row, which detracts from the experience. While it's not a perfect solution, I tend to solve such situations in my games by means of boosting vertical velocity artificially when changing screens upwards. That way 1.- it gives the player extra time to look for a landing platform and 2.- prevents such situations where you just didn't jump high enough from the screen below. Great job, nonetheless. The music is superb and the mood and athmosphere is great. @tepples: Yes, I could reproduce the crash. There's a stupid bug in the startup code. Well, actually, the bug is very smart, but the programmer was stupid. Do you want to have a hotfix? @dougeff: No, but almost. It's a bankswitching problem, indeed. Phew, this NES project is challenging. Thank you all for the feedback!! Hmm, unless i misunderstand you, it's not that its not pixel perfect in definition. It's that sometimes it's off by 8px blocks which means you can stand half inside a grid-bound 16x16 block. I mean to play this again soon (and this time be able to beat it, hopefully!). Would it help if i PM:ed you screenshots and descriptions any such occurrences i may come across? Phew, this NES project is challenging. It's quite an impressive scope this game has - and still, you managed to do it! This game is a great addition to the NES library. 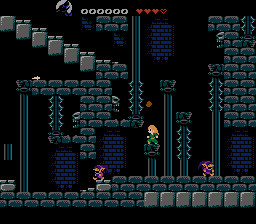 Minor quibble: The red projectiles shot by the skeletony stone heads are way too dark, IMO. I can hardly see them against the black background with the palette I'm using. I would be worried that this might be an issue on some displays when playing on hardware. I think Haunted Halloween 86 had a similar problem with a deep red used in its backgrounds. What version of the FCEUX emulator have you used to test both "Action 53 volume 4" and "Wolfing"? My copy of FCEUX (SDL) is r3392. My build of the Windows version (used for debugging) from AppVeyor is also r3392. But the reset button bug also happens on hardware. 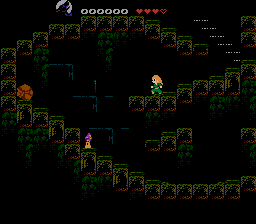 I haven't opened my NES-001 Control Deck, but I'd be surprised if the CPU and PPU were anything but revision G.
I saw FrankenGraphics post, I recorded these GIFs, my internet went out for a whole day before I could even upload them to post. Standing on air as the worst offender. Quite far into a wall. The behavior itself could probably be fixed without much hit to CPU time (it may even use LESS CPU time depending on what you're doing), but actually a lot of the level design appears to rely on it. When I first played I noticed the collision stuff as well, but I never found any zips or anything. But I also didn't find the stand on air thing. Last edited by Kasumi on Tue Feb 06, 2018 10:07 am, edited 2 times in total. The situation in the bottom screenshot is pretty easy to reproduce as it happens to me every time. No big deal, tho'. Does it work now with "Action 53 volume 4" (or powerpack?) Tepples? @Kasumi: Yes, I know these 3 glitches. That's what I call "not pixel perfect background collision"
The crash bug appears to be fixed in FCEUX debugger. I will include the fix in the build I post to page 2. I couldn't work around the way you lose momentum, and kept dying in the first outdoor part, where you go left as wolf and fall to spikes if not perfectly timed. After five deaths I said screw it and closed it. The idea and the art were quite nice, but the gameplay has some issues. Ling keeps most of her momentum after landing. You're right, this makes the controls more intuitive. Zolionline is improving the rooms a bit and then it should be finished. Is there a deadline for the improved version? My guesstimate for when volume 4 updates are due is when Paul at INL actually gets around to releasing volume 3. Update: I have improved the compression scheme of the game map to add 20-30 new rooms. Here's a preview of a 2nd castle (left) and a new subterranean area (right).